(June 29, 2011) Rongcheng is one of China’s loveliest cities, surrounded by both the Yellow and Bohai seas. When writer Yang Furui pays a visit, he finds economic gains have taken a severe toll on not only Rongcheng’s seashore, but China’s southeastern shoreline in general. 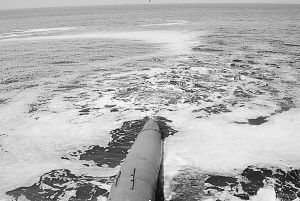 A drainage pipe spills waste into the Bohai Sea, one of two seas that surround the city of Rongcheng. Rongcheng once ranked as northern China’s strongest city economy in the early 1990s. Rongcheng is a beautiful city that faces the misty Yellow Sea backed by the towering peaks of Cha Mountain, which float above it, marking the area as a renowned scenic attraction. [i] When I travelled there recently, I found a great deal of black coloured wastewater flowing from a factory near the shoreline, directly into the sea. Local people said this was common for the area and that you could hardly see a stretch of seashore free of these waste outlets anymore. “The owner of the polluting factory is a relative of a local village’s cadre,” an old fisherman told me. Cadres[ii] in the area struck it rich by taking advantage of their privilege, he said, while common villagers remain poor. Indeed, the old fisherman no longer makes ends meet from the sea – he now lives on what he manages to grow on a few patches of land. “Why doesn’t your family make a living from fishing?” I asked. “No fish exist here anymore,” he said. “When I was younger, there were so many fish you could not catch them all.” But now, he said, because there are so many fishing ships and so much pollution, wild fish have become almost extinct. I saw a man fishing with several poles and went over to view his catch. In a bucket were several little fish no longer than 10 cm. Not far from the shore lay an area where sea plants grew. Although, sea farming[iii] has made a small group of people rich, it also produces pollution with consequences for everyone. What I saw in Rongcheng represents only a microcosm of the pollution along the seashore. Yet, the sea water still looks blue. In fact, most sea pollution is caused by polluted rivers flowing to the sea. A friend showed me a picture of the Ziya River that runs like soy sauce into the Bohai Sea at Tianjin. (Rongcheng is surrounded by both the Bohai and Yellow seas). The Bohai Sea is one of the most polluted of China’s four seas. When I travelled to the seaport city of Qinhuangdao 17 years ago, I couldn’t even see the sea, it was so murky and muddy. Looking along the shoreline, drainage pipes from hotels, restaurants and houses lie side-by-side, spilling their waste into the sea. It is reported that the Bohai has become a desert sea, bereft now of aquatic life. Its shore is swimming with heavy metal elements – such as mercury, cadmium, lead, copper and so on – that bring harm to the health of the Bohai. Furthermore, China’s ‘red tide’ of toxic algae blooming along the country’s coastline has caused enormous damage to China’s economy and the southeastern shoreline. 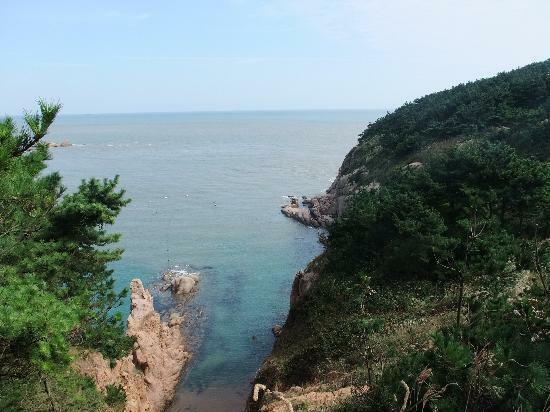 An idyllic view of Rongcheng’s coastline. China has become rich rapidly but the gains of wealth have exacted a tremendous toll on the environment. Nature is retaliating against us, for our greed, and will not stop until we cease creating harm. I hope Rongcheng can recover its beautiful seascape and avoid becoming so polluted that it is uninhabitable. Yang Furui is a researcher with the Transition Institute, an independent think-tank based in Beijing. Yang focuses on issues related to peasants, villages, and agriculture. Currently, he is researching the results of the New Rural Cooperative Medical Scheme. He also conducts research on the development of democratic institutions and the rule of law. He has translated two books: Damming the Three Gorges and The Victory of Democracy in Spain. He can be reached at yangfurui1@gmail.com. Read other stories in Probe International’s Voices from China series, here. Back to text: [i]Rongcheng has the distinction of being the eastern-most city in Shandong province, just a few miles from the juncture of the Bohai and Yellow seas. The Bohai Sea is the innermost gulf of the Yellow Sea on the coast of Northeastern and North China. Back to text: [ii]The term cadre refers to a public official holding a responsible or managerial position, usually full time, in government. A cadre may or may not be a member of the Chinese Communist Party, although a person in a sensitive position would almost certainly be a party member. Back to text: [iii]Sea farming or sea ranching: the cultivation of saltwater aquatic organisms and plant life, under controlled conditions.